At the earliest stages, the builders are still building. The number of GitHub IoT repos doubled in the past year, enabled by more accessible IoT infrastructure, platforms and devices. 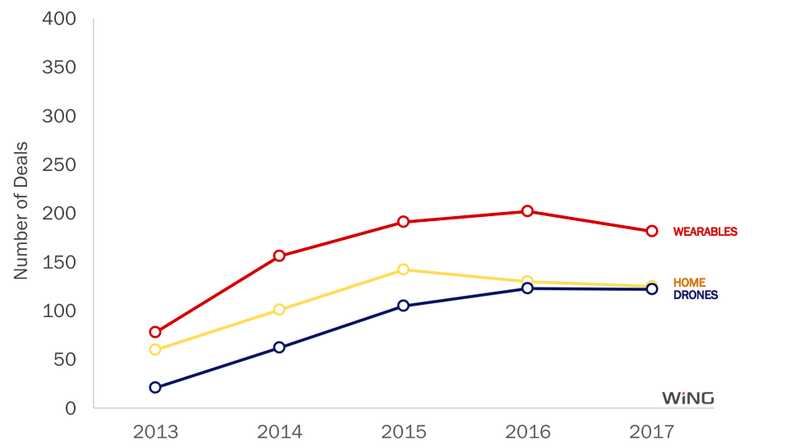 Downstream from GitHub, our ‘Wingdex’ shows a steady increase in deals and a large jump in invested dollars. 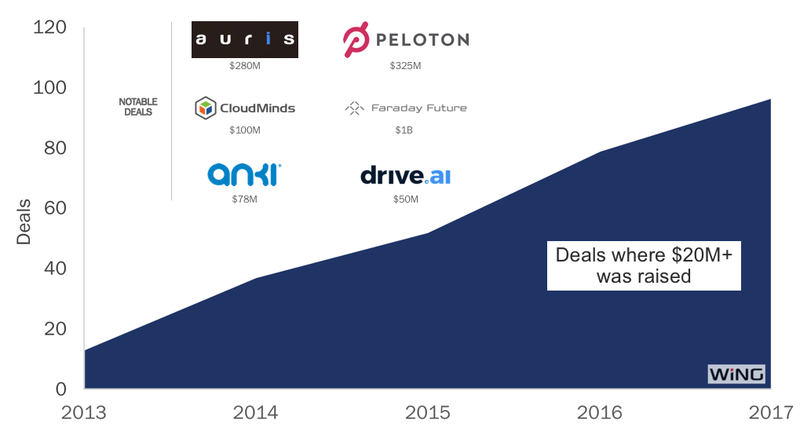 That dollar jump comes from a wave of $20M+ financing rounds, as the early IoT winners emerge. Ubtech (Robotics), Auris Surgical (Health), Ring (Home), and Mapbox (Infrastructure) are examples of this. Our first surprise was this: consumer-oriented IoT like Home, Drones, and Wearables are actually declining in number of deals, unlike their commercial cousins. This indicates healthy maturation of the technology, as we move beyond hobbyist applications into core business applications. We found that Autos drew the strongest investor interest, with average deal sizes of about $25M, almost three times the next largest category. This capital is following the toughest technological challenges: autonomous vehicles. But behind this, three battles are underway. First is a battle between China and the West, with $3.2B in Chinese-driven capital invested in only 3 companies: Faraday Future, Nio, and LeEco. Second is a battle between the old guard of the auto industry and technology-driven challengers like Uber, Google, and Baidu. A third battle is for the future of transportation itself, as we reimagine what it will look like. While we can’t count on mega-deals every year, Auto will be strong for the foreseeable future as these battles play out. The next area that jumped out was Commercial IoT: it is breaking away from all other categories in number of deals. Commercial IoT’s rise is a healthy one, spread broadly across Manufacturing, Healthcare, Buildings and Cities, Logistics, Agriculture, and other categories. One important trend, though, is a shift from carpet to linoleum, concrete, and dirt. The proportion of deals targeting heavy industry has increased from 48 to 65 percent over just 5 years as IoT serves tougher environments. Companies like Actility (Utilities), Geekplus (Logistics), and Rethink Robotics (Manufacturing) epitomized this shift. IoT Infrastructure showed strong growth in 2017, particularly in two core layers: sensing and connectivity. We’re moving beyond technology borrowed from PCs and mobile into native IoT infrastructure. We expect this trend to continue as we increase IoT reach and efficiency. Significant deals in Infrastructure IoT include Royole (Sensing), Sigfox (Connectivity), Brain Corp (Data, Analytics, and AI), and Qadium (Security). IoT Security is still a problem. We see the biggest gap in Autonomous Vehicle Security. There is some progress in overall IoT Security, concentrated at the gateway and network layer. This makes sense given the wide variation in IoT endpoints. It also draws on the pre-IoT history of network security. We expect to see more IoT security at the device, cloud and application levels in the next few years. Notable IoT Security deals included Qadium, SparkCognition, and Bastille Networks. 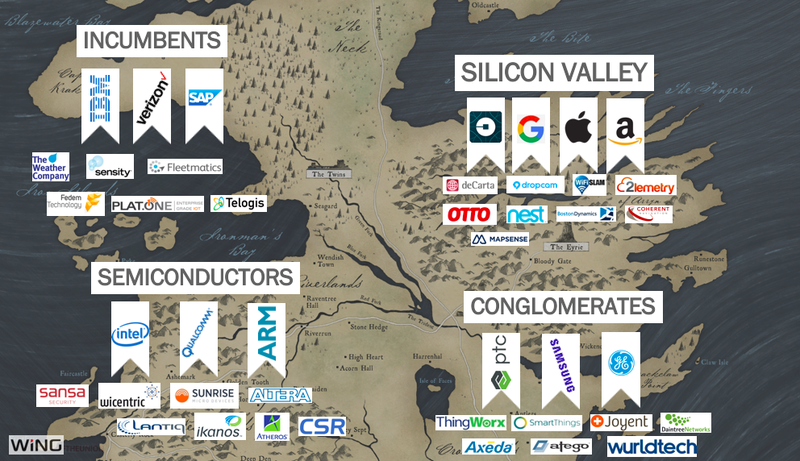 Finally, before we finish, a sneak peak into something we’re working on: an effort to better understand IoT Founders. In looking at almost 2000 talented founders, we found they’re significantly more educated and have more industry experience than in other categories. Infrastructure founders lead the way at 12 years of experience before starting their companies, compared to 8 years for founders of Commercial IoT startups, and less than 5 years for founders of Drone companies. We’re in the midst of a shift to a world where IoT drives 10 times more compute, data, and traffic. We call it IoT = IT X 10. In areas like Autos, we’re just seeing the beginnings of these shifts, but the impact will be much broader, spread across many industries. As we move through this transformation, Wing will continue to survey current and future startup IoT activity. To see many more insights, check out the blog post on Wing’s blog.